Born in Australia, Margot L. Stedman now lives in London. She made her debut with the novel The Light between Oceans, which became very fast a bestseller and was translated in more than 30 languages. We spoke with her about multiculturalism, about what being a „full time writer means” and how she, as a lawyer, ended up writing fiction. You were born and raised in Australia, and then you moved to London. What are the main differences between the two cultural and literary environments you noticed? Everyone will experience this differently, but the thing I most notice is the effect of climate on culture and lifestyle. In Australia, I spend much more time outside, soaking up sunshine, whereas London weather means much more time indoors. Here in London there are four very distinct seasons, which bring with them a strong rhythm to the passing of time. In Australia the differences are more subtle, and we think of time less in terms of seasons there. I think each population travels to find what’s lacking at home: the British visit Australia for blue skies and wide spaces, whereas Australians come here in search of centuries of European history and tradition, and green landscapes. Do you feel you belong to two cultures or do you believe in a globalized world and culture? I feel at home in Australia and in the UK, with their slightly different cultures. That said, my book has now been translated into something like forty languages, and when I ask why publishers in Thailand or The Lebanon want to translate it, they say it’s because its story is „universal”. I wonder if „globalised” carries a slightly negative tone, whereas „universal” suggests the positive aspect of shared human experience? I love how these basic common elements find expression differently in different cultures (the various book covers illustrate this rather well). You were first a lawyer, how did you feel inspired to write? 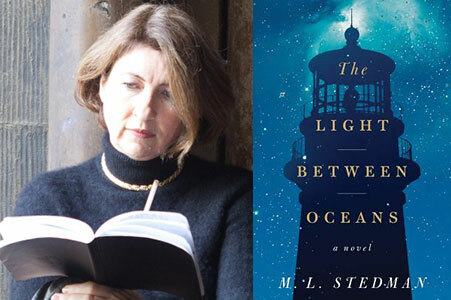 How did The Light between Oceans come to life? To answer the first part of your question – I’m not one of those people you read about who have been writing novels since the age of two! I have always loved reading, and of course, as a lawyer, I had to have a facility with words, but I’d never attempted to write fiction. I distinctly remember sitting at my computer in my office one day in 1997, and getting an almost bodily sensation of wanting to write. As to the second question – I write fairly instinctively, just seeing what comes up when I sit down at the page. For this story, it was a lighthouse, then a woman, and a man. Before long, a boat washed up on the beach, and in it I could see a dead man, and then a crying baby. I just followed what I could see. I certainly had no idea I was writing a novel when it started: that would have been far too daunting! Instead I just sort of tricked myself into it. In The Light between Oceans, you speak about the scars left by war and violence, more specifically The First World War. Do you think we can still relate to those events as having consequences in the present or is The First World War a symbol of all conflicts that devoid people of their humanity? I think both are true. Many families still hold collective memories of men lost all those years ago. The scars of war can be passed down through generations: through death or debilitation, the war fewer healthy husbands and fathers, and that shaped their families. And yes, I think that that war does stand as a symbol of all that is lost by armed conflict, wherever and whenever it occurs. The setting is a remote island, where everything seems to become possible. Is this island a metaphor for the human need of solitude and peace in the midst of the rush and agitation that characterizes our world? The island represents different things to different characters. To Tom, it brings solitude – that positive aspect of being alone, which enables calm reflection. Isabel, on the other hand, is much more of an extrovert, and experiences it as isolation, cutting her off from her parents and community. I suspect the response depends on freedom of choice: there’s nowhere else Tom would rather be: it’s a very healing place, allowing him to process the events he’s endured. Isabel, on the other hand, is only on the island because she wants to be with Tom – it’s not somewhere she would go by herself. The island also has the effect of stripping away „background noise”, so that everything is focussed just on that handful of people and the consequences of a few fateful decisions. Can the main characters, Tom and Isabel, who desperately want a child, be seen as a modern reincarnation of the first couple of Adam and Eve? I did notice the Adam and Eve aspect as the story took shape (though I don’t think Adam and Eve are said to have wanted children?). I thought of the shape of the story very much in terms of paradise „before the fall”, when Tom and Isabel first go to Janus, then, when things unravel, their life becomes more „Paradise Lost”. The perspective upon the world and upon the possibility of a happy end is rather bleak. Why do you put your characters in this context? Is it because, in the end, every story, be it an individual or a collective one, inevitably becomes an „unvisited headstone“? Without wanting to give away too much about the plot, I have to say that the way I see it, the ending is far from bleak: there is resolution and redemption and hope. In the case of the lives of Tom and Isabel, their lives will be reduced to an unvisited headstone, and they’re at peace with that knowledge. It in no way reduces the value of their love and life together. As for the wider world, in some rare cases, against the odds, lives end not with „unvisited headstones”, but with literal and metaphorical memorials that continue to be visited. I find it uplifting that we can hold dear people we never knew – musicians, say, or poets, who died hundreds of years ago, but who reach across time to touch us with what they created. Nonetheless, every life has an absolute value, whether or not it is remembered. The idea of a couple who desperately wants to have a child and can’t has roots in every culture, in various myths and stories. What does this subject represent to you? I’d say that it’s only Isabel who’s desperate for a child, and that Tom is desperate to make her happy. For me, Isabel’s desire was an interesting mechanism to explore the wider question of getting or not getting what one wants, and what the effect of that is on a person. Here, the object of desire happens to be a child, but it could be anything one believes is necessary for fulfilment. I think that coming to terms with not getting what we think we need in order to be happy can set us free, opening up so many other possibilities. After this first novel, which was enthusiastically received, are you ready to consider yourself a „full time“ writer, dedicating yourself only to writing? I wrote the book just for my own enjoyment, so I’ve been simply astonished by its reception. I’m still trying to make sense of it all, and I’m enormously grateful to the many wonderful people who helped bring the book into the world, and for my sheer good luck. I’ve certainly been a full time writer since the book was published, if only in the sense that my time has been completely taken with promotion and book tours around the world. I’m grateful that I don’t have to produce another book to a deadline, so I can go with what feels right in any next writing venture.